via Fashion Distraction, similar shorts here. 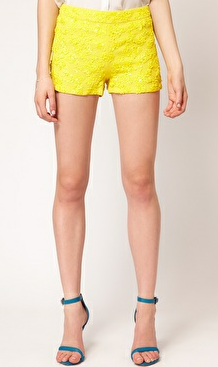 My favorites for summer 2012 are the bright, lace-covered shorts. I'm also a fan of the printed and scalloped shorts, too. These green Knicker shorts from ASOS are adorably preppy! I mean, can't you just envision Kate Middleton sporting these? 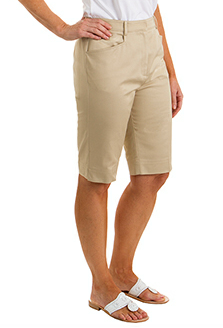 For more "mature" ladies or gals who just want to show a little less gam, these Ann Taylor shorts are classically pretty. 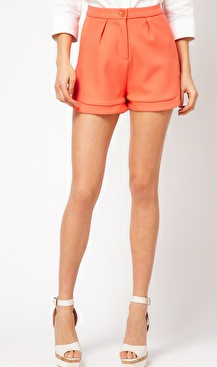 You can also enjoy the pop of color of the shorter shorts, but in a longer length with these from ASOS. Now, let's talk about what not to wear. At all costs though, PLEASE don't wear the "Mom" short. I guess the proper term is "Bermuda" shorts, but I just like to call it "gross". Nothing will make you look frumpier or dumpier quicker than right-above-the-knee shorts. I think it has something to do with the cut and how the legs taper in at the knee. You are all far too cute to do this to yourselves, ladies. I don't care if you're 16 or 60, size 2 or 22. Just don't do it. Okay, what have we learned today? Shorts in bright colors are good. Shorts with scalloping are good. Longer shorts are dandy, too. And Bermuda shorts should find themselves a nice home in the bottom of a wastebasket. Yes please...to all of these (except the mom shorts). haha im dying at the "mom" shorts! I HATE it when people wear those!! great picks girlie, I am short obsessed as well! I think Bermuda shorts make me look like I'm about two feet tall. 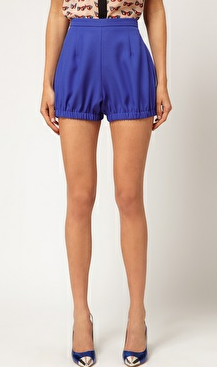 Love the royal blue shorts, but have a feeling they would end up looking like hot pants on me - not cute! The scalloped shorts are precious. Love them! And totally agree on the 'mom shorts' thing. Who designed those fugly things in the first place? Ew! I find that a lot of hipster types wear Bermuda shorts also...and the majority of those "hipsters" are dudes. And they're often just cutoff jeans. I have a bunch of longer shorts as that was the rage a few years ago when before it was all about short shorts which seem to be making a comeback. I kind of have a mix of both now and am pulling out the shorter ones again-well, I will once the darn weather starts to warm up more! My longer shorts are just above the knee not at it so I barely made the cut on not having mom shorts!! OOhh I love the yellow ones from ASOS. And I couldn't agree with you more on the "mom short". YUCK! Wonderful post, Leslie! I am smitten with the Ann Taylor shorts. I myself won't be wearing short shorts anytime soon but those I think I could rock! Bermuda shorts are on my "Like/Dislike" blog section. You can bet which area they fall under...eww! I agree with the mom short (no!) style. love the patterned and lace shorts! i could not agree with you more! i love all of your choices. i love to show a little leg, too. my legs are my favorite body part. gotta work with what you got, ya know? Oh my! 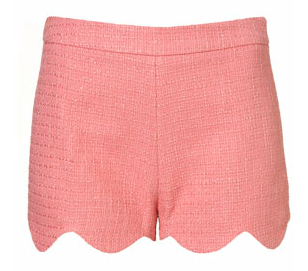 Those scalloped shorts are ridiculously cute, especially the color! I actually don't know where the watch came from. The photo came from Fashion Distraction, a blog I like, so you might check there. Sorry! Some of these are really pretty shorts! I'd prefer the shorter ones over the longer ones. But I love the bright colors on all of them! I also wanted to let you know about a great giveaway from Shabby Apple that I'm hosting right now! Hope you enter!